In boom and in bust, homeless encampments are a product of inequality and neglect. 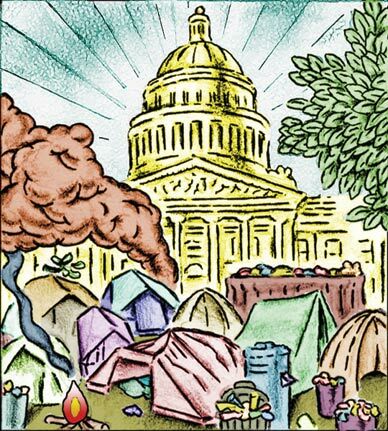 “This is the bigger picture,” said John Kraintz, with a sweep of his arm, indicating the roughly two dozen remaining tents pitched around him on a muddy, pockmarked field between the city dump and the slow green waters of the American River. Kraintz is a thin man of 57, a former electrician who had lived in Sacramento’s parks and riverside lots for seven years. His home had been right here–in Tent City. Kraintz had relocated to Tent City’s outer boroughs. Its downtown, which briefly attracted camera crews from all over the world–a Third World shantytown in the capital of the richest state in the richest country!–was a couple of hundred yards away. Depending on whom you ask, somewhere between 150 and 300 people lived in Tent City between November and April. But by the third week in April, when I visited, most had already packed up. Some had migrated to this spot to avoid police attention. But the cops came, handing out notices announcing, “It is unlawful to camp in the City of Sacramento” and giving people two days to leave. (“This is not camping–we’re living!” yelled one of Kraintz’s neighbors.) By the end of the week, everyone had left. Tent City, for that moment at least, had disappeared. Few people there, though, doubted that it would be back. Tent City is less a single location than a nomadic but constant phenomenon, a shifting blue-tarped shadow to the glass and steel American metropolis. In good times and bad, Tent City comes and goes, forms and scatters and takes shape again. Despite its momentary dispersal in Sacramento, it is still out there–in Seattle, Portland, Reno, Providence, Fresno, even in the sprawling exurbs of southern California in the small city of Ontario. Tent City existed at the height of the real estate boom too, hidden in plain view, an omen for anyone willing to look. While recent media accounts portrayed Tent City’s incarnations as creatures of the recession–reborn Hoovervilles for the laid off and the foreclosed–shantytowns have been a periodic but permanent feature of American urban life for at least the past two decades. They are what connects us to São Paulo, Lagos and Mumbai, physical manifestations of our growing inequality and societal neglect. Seattle saw its first Tent City in 1990. The area now boasts three, one dating back to 2000, another to 2004. Portland’s Tent City (“Dignity Village”) has been around since 2001. No one living there, says resident Gaye Reyes, is recently homeless. In California’s San Joaquin Valley, the City of Fresno last fall began distributing a $2.3 million settlement to homeless people whose property was destroyed when the city repeatedly razed its Tent City between 2004 and 2006, at the apex of the economic boom. As early as 1989, dozens of homeless were pitching tents on the precise site of this year’s Tent City in Sacramento. They called their community, without irony, “Camp Hope.” Since then, other tent cities have sprung up there for a few weeks or months. It’s hardly an idyllic spot–no sanitary facilities, few trees, no shelter from the wind or rain–but it’s out of sight and a short walk to Loaves and Fishes, a nonprofit that provides free meals and other services. This latest Tent City was notable mainly for its density, a product of increased enforcement of anti-camping ordinances in the city’s parkland, where Sacramento’s homeless were once able to spread out unmolested. In November police broke up a camp of more than 100 people on the sidewalk outside the Union Gospel Mission. Police officers instructed them, Tent City residents said, to resettle here. The Sacramento Bee first reported on the newest Tent City in December. Oprah Winfrey sent a correspondent in February. After that, said Tent City resident Danny Valadez, “It went like a cyclone,” buzzing with journalists and new arrivals. Most reporters focused exclusively on the few Tent City residents whose predicaments could be linked directly to the economic collapse. “They were all looking for Henry Fonda [in The Grapes of Wrath],” laughs Paul Boden, director of the Western Regional Advocacy Project. The economic collapse has without question pushed people out of their homes. The National Alliance to End Homelessness warns that 1.5 million Americans could be thrown into homelessness over the next two years. In Sacramento, homelessness has jumped 14 percent since 2007, even though the population categorized as “chronically homeless”–the disabled and mentally ill–has fallen by 35 percent. Sacramento was hit particularly hard by the mortgage crisis–the city had the third-highest foreclosure rate in the country in 2007–and folks who have recently seen their incomes disappear are finding themselves with nowhere to turn. California’s ongoing budget crisis hasn’t helped. Last year Governor Arnold Schwarzenegger slashed the state’s already meager funding for emergency shelters. The year before, he vetoed a $55 million program that would have provided housing for 5,000 people with mental illness. His most recent budget proposal slashes nearly all the services that aid the growing ranks of the poor–cutting eligibility for Social Security and disability and eliminating what’s left of the state’s welfare system, as well as its entire health insurance program for children. The governor plans to borrow $2 billion from cities and counties, which will mean severely reduced funds on the local level. All of this likely will throw more people onto the streets. But Tent City, says Joan Burke, advocacy director of Loaves and Fishes, “is the least desirable place to be homeless,” and the last place the newly homeless are likely to end up. They stay with friends and relatives until those relationships fray, then in motels, cars and finally shelters. Thus, only a very few of Tent City’s inhabitants could pin their plight on the recession. Karen Hersh, 53, her skin red and peeling from poison oak, attributed the failure of her trucking company to rising fuel prices. She lived in her truck when she lost her home and stayed with friends when she lost her truck. Eventually, Hersh ended up in a shelter–“I didn’t like it one bit. They steal from you. They gang up on you”–and finally in Tent City. “I used to be a Republican. I voted for Ronald Reagan,” a man who identified himself only as Tom M. told me, laughing. But it was Reagan who in his first year as president halved the budget for public housing. Over the course of his first term, more than half a million people were thrown off the disability rolls. “Until then,” says Tim Brown, director of Sacramento County’s Ending Chronic Homelessness Initiative, “basically there was no homelessness.” Since then, neither the disability nor the housing budget has come close to recovering. Clinton-era welfare reforms cut all but the last remaining threads of the Great Society safety net. Meanwhile, the real estate boom led to a drastic reduction in affordable housing. Through the 1980s and even into the ’90s, says Sacramento Self-Help Housing’s Foley, the city had no shortage of housing options for the poor: rooming houses, single-room-occupancy hotels, motel-like labor camps for cannery workers. “Almost all of that’s gone,” he says, victims of the insatiable housing market. Gone also are the vast majority of the unionized cannery and food processing jobs that for decades made it possible for workers here to become homeowners. Tent City sprawled just across the railroad tracks from one of the few major food processing facilities left in the city: the nonunion Blue Diamond almond plant. For Tom M., the math was simple. He fell out of the corporate world several years ago and lived in his van until January, when he could no longer afford to keep it registered. He is 56, with high blood pressure, a heart condition and, he said, “the mental thing”–he’s convinced he’s being stalked. “It gets pretty intense sometimes,” he said. But he has been unable to qualify for disability, which left him with what little money he could earn recycling cans and a monthly county General Relief check for just over $200. In the end, Sacramento dealt with its Tent City with more compassion than can usually be expected. “If they had a great big rug they could sweep us under somewhere, they would,” predicted Karen Hersh, and she was right. The broom, fortunately, came in the form of temporary fixes, not arrests. The city scrambled to raise money for forty additional units of subsidized housing (few of which were ready before Tent City was cleared) and fifty additional shelter beds, which quickly filled. Local advocates for the homeless had vowed civil disobedience if any arrests were made, so to avoid an embarrassing confrontation, the city came up with motel vouchers for the last few dozen holdouts. “The bulk of the people,” though, said Loaves and Fishes’ Joan Burke, “just dispersed to more hidden camps.” By April 20, everyone was gone. No one pretended the problem had been solved. Renting hotel rooms for the homeless, said Steve Maviglio, a spokesman for Mayor Kevin Johnson, “is obviously not sustainable in the long term,” particularly with homelessness on the rise. For now, the newly homeless, whose predicaments are directly related to the recession, are not yet desperate enough to camp in blighted fields. They look less like John Kraintz and Tom M. and more like 38-year-old Kysia Bell, a clear-eyed home healthcare worker and mother of two who lost the home she was renting when her landlord fell into foreclosure. “I didn’t know that the owner wasn’t paying the mortgage,” she said. “We got a note on the door that we had to vacate within two weeks.” At the same time, her hours were cut, making it impossible to come up with the deposit for a new apartment. She and her daughters stayed with relatives as long as they could, then with friends and finally in her car until they found beds at St. John’s, Sacramento’s largest shelter for women and children. Bell was lucky: in 2007, St. John’s was forced to turn away about twenty people a day. So far this year, that number is up to 300. Nearly 400 miles south, in Ontario, California, Tent City hides behind a bureaucratic mask. City officials call it the Temporary Homeless Services Area, or THSA, but until March 2008, it was just Tent City. About nine months earlier, local police began directing everyone they found sleeping in parks and alleys to an empty field near the city’s airport. Word got around that you could camp there unharassed, and the new encampment quickly grew. As in Sacramento, the Ontario Tent City’s inhabitants were victims not of the immediate recession but of older, less dramatic economic shifts. Take the white-bearded man who identified himself only as Cowboy. He was a long-distance truck driver until a stroke slurred his speech and paralyzed his right arm. The $900 in veterans’ benefits and SSI he receives each month might pay for a small apartment but would leave nothing for food, so Cowboy lived with his mother until she died, then with cousins, then on the streets and finally, at age 57, in Tent City. In March, after herding the local homeless population to Tent City, police and code enforcement officers descended on the encampment and required its inhabitants to prove they were residents of Ontario. Those who could not–all but 127–were evicted. The city bulldozed and graded the field, erected orderly rows of matching green tents, issued ID cards to those who remained, fenced the encampment and posted a list of rules: no re-entry after 10 pm, no alcohol, no pets, no minors, no visitors. Now private security guards patrol the THSA’s perimeters, ejecting anyone who doesn’t have permission to be there, including reporters. None of the Tent City residents I interviewed from just outside the fence complained much. They were fed three meals a day and were otherwise left alone. The rules were infantilizing, but the people largely shrugged them off. Still, more than a third of those permitted to stay in the THSA have left for good. No new arrivals have been admitted. Isaac Jackson, coordinator of the county’s Office of Homeless Services, credited Ontario with doing “a great job” of reducing Tent City’s population. Neither city nor county officials, though, knew if any of those who have left Tent City have found a better source of shelter than a tent. It seems unlikely. The federal stimulus package will give California $189 million in homelessness prevention funding and another $100 million in community service block grants that local governments can use for homeless services. The Homeless Emergency Assistance and Rapid Transition to Housing Act, passed in May, authorizes another $2.2 billion nationwide. But as the feds give with one hand, the state takes away with the other, and no one at any level of government is attempting to tackle the systemic roots of homelessness, or to reconsider housing as something more vital to human dignity than market forces allow. For now, Cowboy and his neighbors are unaware of any resources available for more permanent lodging than a tent in a fenced-off field.